Tephra is an evolutionary roleplaying experience built by gamers who enjoy an easy-to-learn system with unlimited options. You’ll feel at home in our system, using just one die (a twelve-sider), over 400 different character abilities, and a seemingly unlimited amount of character combinations. Delve into our rich and easy crafting system: customize your razor-edged, chainsawing claymore or your electrified, steam-powered longrifle to your heart’s content. And it doesn’t stop at weapons – you can build an entire automaton, a jet-pack, explosives, poisons, and more! From our easy character creation system to our intuitive and fast-moving combat rules to our enormous array of character abilities, Tephra will leave you building, creating, and dreaming until you can’t take it anymore. 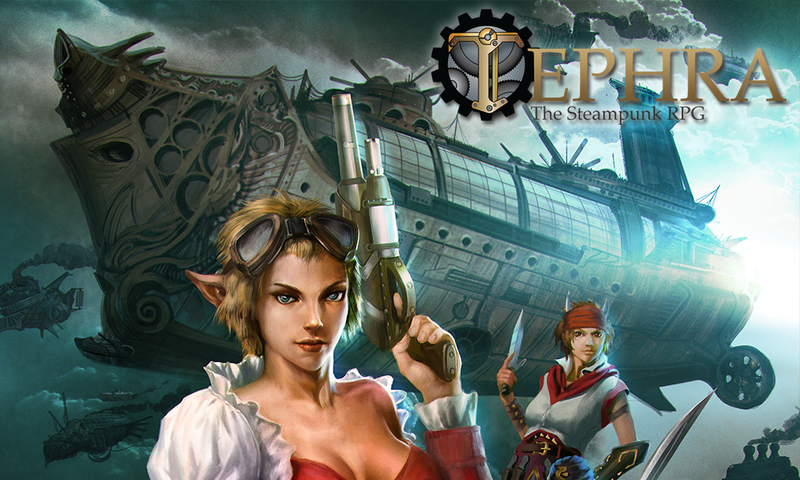 This is steampunk – the options are unlimited. To begin, you’ll need a single die: a unique one with 12 sides. This is the foundation for the Clockwork System, a die that can randomly give you any number from 1 to 12. With this special die, occassionally called the D12, you’ll be able to determine how successful you are on any given task.You’ll have skills, attributes, and various other traits that all have numbers assigned to them. When you need to determine how well you succeed at something, you’ll roll your die and add on the appropriate number. Rolling your Dexterity? Roll your D12, add the number in your Dexterity attribute, and you’ve got your result. The game revolves around tiers – four tiers, to be exact. Once you’ve received the result of your die roll, you’ll be able to determine what tier it is. T1 (Tier 1): Result of 1 through 9 – Barely Passing. T2 (Tier 2): Result of 10 through 19 – A Solid Success. T3 (Tier 3): Result of 20 through 29 – Phenomenal! T4 (Tier 4): Result of 30 or more – Beyond Human. Tier 1 is the most minimal of a success. If you’re trying to jump, all you can say is that you successfully jumped. Nobody takes notice until you get to tier 2. A tier 3 is the utmost of human ability. If you’re hitting a tier 3, that means you’ve just leapt a chasm. When you build your character you’ll first distribute some points in your skills. Skills are those areas that you’ve trained in. Swashbuckling, Brawl, Gadgetry, Marksmanship – these are all skills. Once you’ve chosen your skills, you add up all the points under the skill to determine how good you are at the attribute. You can see all of the attributes (bold) and their skills below. Attributes are the baseline pieces of your character. Your attributes determine how fast you react, how well you push back, how long you survive poisons, how quickly you process information, and a whole plethora of actions that anybody can do.There are five attributes: brute, cunning, dexterity, spirit, and sciences. You will start with a zero in each of these attributes, but as you gain experience in your skills, your attributes will increase as well. Each attribute has a set of skills that fall underneath it. As you gain points in your skills, add up all of the skills under the attribute to figure out what your attribute score is. Each attribute will include a variety of different options you can use that attribute for. Dexterity, for example, is used when tripping people, disarming them, trying to be stealthy, attempting to squeeze into a tight spot, or anytime that your hand-eye coordination is going to prove valuable. Specialties are character-defining abilities that allow you to do amazing things. Specialties are found under skills. If you want an Agility specialty, for example, you flip to the Agility page and peruse those specialties.And the more points you have in a skill, the better you’re going to be at using your specialties that come from that skill. Specialty Bonuses: Each specialty has a couple bonuses, or “combat statistics,” that it grants the adventurer. These include accuracy, strike, speed, and many more. These specialty bonuses help flesh out the character and lead to a very easy character creation process. Just because I rolled a high cunning doesn’t mean that you have to do what I say. With the social tells system, my good attributes can help me weave my way through social situations, noticing people’s social tells, their non-verbal queues, and give me insights into what they’re thinking. You might notice that the duchess is chewing on her lip nervously, or that the industry boss keeps glancing at the clock. Rather than give away the story and simply tell you that the duchess is nervous or the boss is anxious to get home, we’ve introduced a system for noticing these small habits and ticks, giving you – the adventurer – a chance to play off them. And, on occasion, come to wrong conclusions.